China’s foreign investment landscaped changed significantly in 2017, where strategic investors will find that their options have broadened significantly. 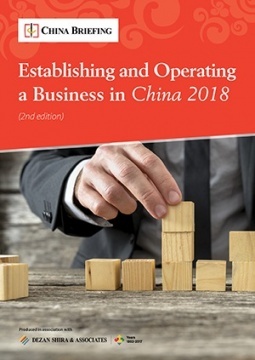 Establishing and Operating a Business in China 2018 is designed to explore the establishment procedures for the Representative Office (RO), and two types of Limited Liability Companies – the Wholly Foreign-owned Enterprise (WFOE) and the Sino-foreign Joint Venture (JV) – along with related business considerations that decision-makers should examine at the pre-investment, setup, and operational stages of the expansion cycle. China’s foreign investment landscaped changed significantly in 2017. The economy is evolving away from manufacturing-centric economy towards a services- and consumption-based economy. GDP growth has slowed and wages have risen, but the economy’s growth outperformed expectations and more industries are open to investment than ever before. In 2018, strategic investors will find that their options have broadened significantly. Decision-makers considering an expansion to China typically must first examine what type of entity to set up – or whether to set one up at all. Foreign investment into China can be made through several types of foreign-invested entities (FIEs). Choosing the appropriate investment structure for your business depends on a number of factors, including its planned activities, industry, and investment size. This guide explores the establishment procedures for the Representative Office (RO), and two types of Limited Liability Companies – the Wholly Foreign-owned Enterprise (WFOE) and the Sino-foreign Joint Venture (JV) – along with related business considerations that decision-makers should examine at the pre-investment, setup, and operational stages of the expansion cycle. We discuss the features of a Chinese business license, the requirements on the registered capital, and issues specific to JVs. We cover the procedure of opening a bank account in China, intellectual property considerations, major tax compliances, employer’s obligations, and foreign currency controls for a foreign-invested entity. Moreover, we walk investors through the complicated procedures of changing or closing down of a foreign business in China.